Delta inverters are good quality but there are a couple of faults that we have been called out to. 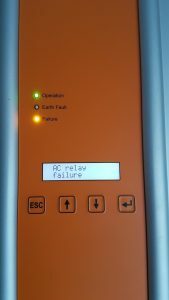 A common fault on many inverters is the failure of the grid relays self-test. The photo to the right shows the inverter display when this happens. Delta will replace the inverter if it is still under warranty but if not, you will require a replacement. The Solivia range have a very common a.c. connector which is the same one as fitted to many other inverters, but their d.c. connectors are not the most common type and will need to be exchanged for MC4 connectors in order to facilitate the replacement. This is not difficult but it does require a particular crimping tool to make a safe reliable connection. If you wish to change your Delta inverter to one of our Solis models then we can guide you to the correct choice for your particular installation. If you want to fit the inverter yourself then we can supply cables with MC4 connectors pre-crimped. Alternatively, we can offer a full supply and installation service within our operating area.